Your family’s safety around the pool comes first. That’s why we offer you extra layers of pool fence protection. 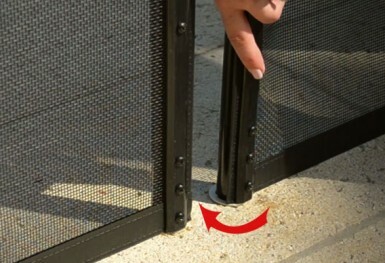 Consider the vulnerable areas of your removable mesh pool fence and you’ll see the value of our SureSafe SystemTM. These safeguards help prevent removal of the fence posts and unlatching of the section latches. 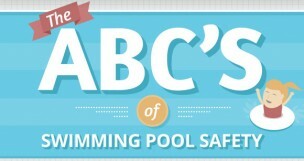 To keep your pool as safe as possible, always follow the ABC’S of Pool Safety. 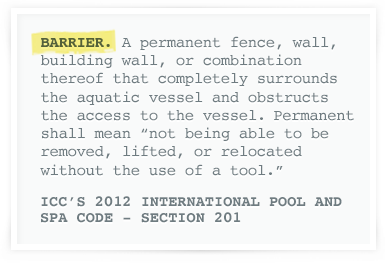 Our SureSafe System Meets the Definition of “Permanence” for Pool Code Inspection. In compliance with ICC’s 2012 International Pool and Spa Code definition of a “Barrier”, Protect-A-Child’s SureSafe SystemTM is fitted with two patented components that elevate it from “removable” status to “permanent”. The Lock-in-Deck Posts lock the fence posts into the patio while the Point-Lock Secure Latch bolts the sections securely such that they require tools for disassembly. Your pool fence posts stay fastened to your patio with our patented Lock-in-Deck technology. This feature makes it easy for an adult to simply twist-lock the posts into the patio, but proves too difficult for small children to remove them. With your posts locked in place, your mesh pool fence is as secure as any permanent fence. Our Lock-in-Deck technology also makes it difficult for babysitters, older children, neighbors, and others to remove the fence without special knowledge of how they work. 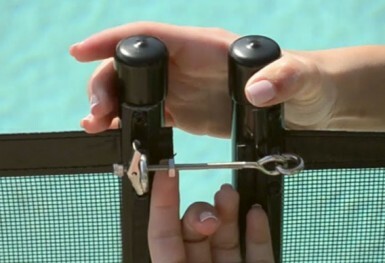 The first line of safety for your pool fence is preventing the sections from being unlatched. This is why we developed our patented Point-Lock Secure Latch. This latch has a unique wing design, and it incorporates a special lock nut that locks the latch in place to prevent opening and removal of the pool fence. We also built this latch to provide an adjustment feature that controls fence tension. The latch is made from 100% stainless steel, which means you don’t have to worry about rust or corrosion. IMPORTANT: As with any gate, a towel or toy blocking the gate can prevent closure, so make sure you keep this area clear. We always recommend adult supervision to ensure maximum safety. Your removable pool fence also provides you with a manual opening option for easy access into the fenced area. Wherever sections connect, you can simply unlatch the safety latch and lift one post out of the hole, thus providing a 3-foot opening. An additional hole holds the fence in the open position. Our Lock-in-Deck Posts and Point-Lock Secure Latches keep your fence secure when sections are closed.